BL755 is a cluster bomb. Its primary targets are armoured vehicles and tanks with secondary soft target (anti personnel) capabilities. The BL755 looks like a standard 450-kilogram (1,000 lb) general purpose bomb but with a hard "saddle" on the spine for ejector release and crutching pad loads and a distinctive large turbine-like air arming vane on the nose. The four rear fins are squared off in appearance, but on closer inspection can be seen to be hollow and telescopic. A central extruded aluminum skeleton is divided into seven bays, each containing 21 submunitions (147 total). The submunitions are ejected by means of a central cartridge and individual inflatable bladders for each bay, operating in a similar manner to a car airbag. Ejection on the original BL755 bomb is triggered by the rotation of the arming vane, driven by the airflow. Each submunition is contained within its own SAFU (safety and arming unit) and is telescoped shut. Upon release, the submunition is expanded by a spring. A focal distance stand off and detonating device deploys at the front and a fan of stabilising fins at the rear. Each has a shaped charge HEAT warhead for armour penetration, the casing of which is constructed from wound tessellated square wire, which produces around 1,400 anti-personnel fragments. A single cluster bomb produces a total of more than two hundred thousand fragments. The weapon was developed in the early 1970s by Hunting Engineering, Ltd. of Ampthill, Bedfordshire but manufactured elsewhere at their production facility. The original BL755 has been updated twice. IBL755 is a bomblet update, increasing its reliability and armour penetration. RBL755 is the BL755 weapon fitted with a radar altimeter that acts as a proximity fuze, triggering bomblet ejection at the optimum altitude whilst allowing the bomb to be released from a safe height and distance. 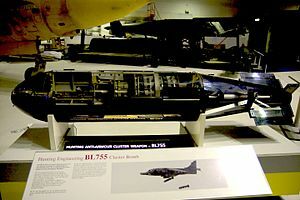 This was in response to the dangers illustrated by low-level Panavia Tornado missions in the 1991 Gulf War; the original vane-armed BL755 had to be released at a pre-determined low altitude, with the attacking aircraft exposed to ground fire and shoulder-launched surface-to-air missiles such as the 9K34 Strela-3 and its variants. The bomb is cleared for use by the Tornado aircraft in the British Royal Air Force. The BL755 was used in combat by the Royal Navy and the RAF during the Falklands War, and the RAF during the second Gulf War (Operation Telic) and Bosnian War. (note it was not used during the first Gulf War except for a small number deployed by RAF Jaguars). On the night of 21 October 1991, a Yugoslavian Soko J-22 Orao mistakenly dropped two BL755 Mk.3 bombs on the outskirts of Barcs, a small city in southernmost part of Hungary, causing extensive material damage, but no casualties. The incident led to an emergency upgrade of the Hungarian Air Force, which obtained 28 new MiG-29B fighter jets in exchange for a write-off of ex-Soviet state debt. The Hungarian government also invited NATO's E-3 AWACS planes to patrol over the Lake Balaton area, keeping a constant radar eye on the Balkan civil war theatre. The Air Force of Zimbabwe's BAE Hawks were armed with BL755s, which were used against the Rwandan, Ugandan and Congolese rebel forces during the early stages of the Second Congo War, in support of Congolese leader Laurent Kabila. The Islamic Republic of Iran Air Force heavily used BL755 cluster bombs on Iraqi troop and armour concentrations during the Iran-Iraq War. They were carried by the F-5E, F-5F, F-4D and F-4E Phantoms. Both Saudi Arabia and the United Arab Emirates have used the BL755 cluster bomb in the Saudi Arabian-led intervention in Yemen and Yemeni civil war (2015–present). German Air Force: Slowly being phased out without replacement. Use restricted to territorial self-defense. Indian Air Force: Currently used by MiG-27s and Jaguars. Serbian Air Force: Used by J-22s. Royal Air Force: Withdrawn from service in 2007/2008. ^ a b Tom Peck. "British-made cluster bomb found in Yemeni village targeted by Saudi-led coalition | Middle East | News". The Independent. Retrieved 2016-05-24. ^ "Saudi Arabia admits it did use UK-made cluster bombs in Yemen". The Guardian. Retrieved 2016-12-19. ^ "Photographic image : Bombing". Timesofindia.indiatimes.com. Retrieved 2016-05-24. Wikimedia Commons has media related to BL755. This page was last edited on 7 December 2018, at 15:26 (UTC).